Convict Creek at Diversion 25, where part of the natural flow is diverted into irrigation ditches to water livestock pastures. Long Valley, California. These willow riparian and native wet meadows are fenced off from cattle and recovering well from historic use. Ditch irrigation is a common use of wet meadows along the eastern front of the Sierra Nevada, where snowmelt streams pour into basins and connect to rivers such as the Owens River and Walker River. According to General Land Office surveys, many ditch irrigation systems were begun in the late 1800s, and have been maintained for over a century by current agricultural users. Commonly, headgates are opened for certain periods along streams that divert a portion of the flow into artificial ditches, that often are allowed to flood out into pastures to extend areas of forage for livestock. The Los Angeles Department of Water and Power (LADWP) owns over 315,000 acres of land in Inyo and Mono Counties, including land, water, and grazing leases in Long Valley. Much of this land is open to the public for recreational use and portions of it are leased to commercial ranching operations for cattle grazing. Historically, 6,100 acres of these lands were flood irrigated on an ad hoc basis, depending on snowmelt and drought conditions, according to LADWP, from streams flowing to the Owens River. LADWP diverts large portions of the Owens River into the Los Aqueduct, to be shipped off to the metropolitan Los Angeles Basin. That was, and still is, a raging controversy in itself. 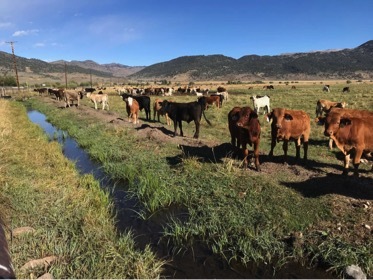 In the summer of 2018 the Los Angeles Department of Water and Power decided to switch off water allocations to grazing lessees on its land in Long valley, saying the drought made it inefficient to continue allocating Sierra snowmelt water for commercial livestock operations. 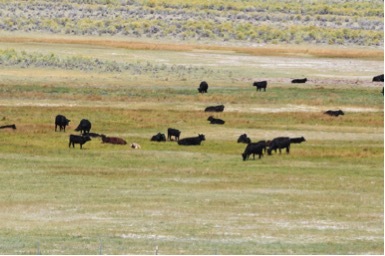 Due to local outcry from ranchers and Mono County, Los Angeles agreed to analyze its lease renewal and water allocations in an Environmental Impact Report (EIR) which began the environmental review process for the proposed Mono County Ranch Lease Renewal Project under the California Environmental Quality Act (CEQA). LADWP proposed to enter into new, 20-year leases, with 10 current lessees of approximately 28,000 acres of City of Los Angeles-owned lands in Long Valley. Ditch irrigation water would not necessarily be included in any new leases. In the current controversy concerning water diversions in Long Valley in Mono County, transbasin diversions are ecologically unsustainable, cattle ranching operations are even more damaging, and both are environmental problems that threaten the survival of native fishes and sage grouse. In the 1990s, I lived and worked in Bishop, California and spent many days doing field work on fisheries in Long Valley for the California Department of Fish and Wildlife. This high valley, part of a volcanic caldera, is one of the most beautiful landscapes in the Eastern Sierra, rimmed by the steep wall of Sierra Nevada peaks on one side, and the obsidian-rich Glass Mountains across the valley. 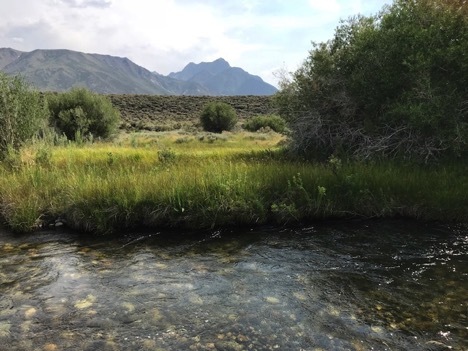 The Owens River meanders through it, as well as Hot Creek—world-famous for fly fishing. I enjoyed long hours wading in the clear icy water of Convict and McGee Creeks measuring trout spawning habitat, which gave me an appreciation for the productivity of stream systems that are left undisturbed by human manipulation. Ungrazed wet meadow with native grasses such as creeping wildrye (Elymus triticoides), fenced from cattle long the Owens River in Long valley. The Glass Mountains are in the distance. Water diversions can be harmful to streams and fish, and so can domestic livestock. WWP opposes more water diversion into the Los Angeles Aqueduct during this era of climate change impacts, that would decrease water in the Eastern Sierra. Having lived in the Owens Valley for years, I personally understand the dark history of water mining by a distant city bent on growing uncontrollably at the cost of drying out another region. I learned much from the late naturalist Derham Giuliani, who witnessed springs in Owens Valley disappear with the groundwater pumping that supplied LADWP with water to be shipped south. Yet the current excessive livestock population, and artificial ditch diversion systems that support it, are also a major environmental problem. Anyone who tells you otherwise is fooling themselves. They degrade water quality, sage-grouse populations, fisheries, and natural meadow and riparian communities in the Eastern Sierra. Ranching in Long Valley is an extractive use. Reduction in riparian vegetation and trampling of streambanks and springs by cattle has impacted much of their limited habitat (such as Whitmore Springs and Little Alkali Lake) by increasing sediment pollution in pools and channels, denuding streamside vegetation critical for shade, and converting complex stream habitats into wide, shallow riffles with little fish habitat value. The water diversions and grazing leases currently controlled by absentee corporate ranches such as the Harris Ranch—the largest beef ranch in California—also cannot be justified. Harris Ranch runs the huge feedlot in the San Joaquin Valley, hundreds of miles distant from Long Valley, that supplies beef to fast-food hamburger chains. 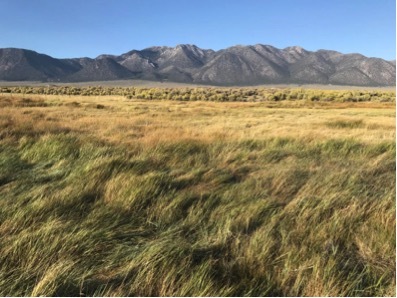 Ecologically valuable Eastern Sierra water and meadow forage resources should not be allocated to corporate operations such as these. During an era of extreme droughts and climate change, the Eastern Sierra should not be giving water away for beef production, especially when greenhouse gas emissions—including methane emissions from cattle operations—are radically threatening our future. Flood irrigation ditch in Bridgeport Valley, California. There are no more sage-grouse in this valley. The rare Long Valley speckled dace inhabits a restricted spring and brook system at Whitmore Hot Spring in Long Valley. This native fish is one of the most critically imperiled non-listed fishes in California and requires intensive and ongoing management, monitoring and would benefit from additional protections. Livestock grazing is one of those threats. The Bi-State sage-grouse is already a candidate for listing under the federal Endangered Species Act. It too would greatly benefit from the removal of hungry cattle herds which graze down the grass cover that sage-grouse and their chicks need to hide from predatory ravens. The Metropolitan Los Angeles area must accept a new era of water conservation and recycling during these times of climate change and increased droughts; southern California urban areas should no longer rely on Eastern Sierra or desert water grabs to supply unsustainable urbanization and development. Lush green lawns simply cost too much water to be sustained. We are in a new era with respect to climate change, and the City of Los Angeles should look to cut back water use within its own coastal basin. At the same time, it is entirely possible that by cutting off irrigation water for livestock and maintaining water in the one irrigation ditch most important for sage-grouse to rear their chicks, the overall result will be improvements in habitat for both sage-grouse and native fishes. Long Valley grazing leases on LADWP land. Long Valley has a wealth of biodiversity and recreational value. LADWP must do its part to conserve these declining species, including reducing the impacts of livestock grazing on habitats. Sage-grouse and fish would be better off if both LADWP and the local livestock producers would leave the water in the streams. Laura Cunningham is the California Director for Western Watersheds Project, a nonprofit environmental conservation group that works to protect and restore watersheds and wildlife throughout the West. From my experience in hiking and monitoring public lands, fencing cattle out of sensitive areas isn’t a long-term, effective solution. The fences either fall down, get trees toppling on them, get cut by recreationalists seeking to cross them or otherwise aren’t properly maintained, no matter what the agency and/or permittee promise in terms of maintenance. Too much supervision and labor is required to keep them properly functioning. Moreover, the fences themselves often pose problems for wildlife–if barbed wire, pronghorn, sage grouse and other creatures can and do get entangled and maimed or killed. Even more “benign” wooden fences give unnatural perches to predators like raptors that prey on sage grouse. The only meaningful solution is to remove the livestock from the area. Heartily agree. Remove all livestock from public lands. Of course I realize this is far from probable, but one can dream. At least, remove the cattle far enough away from sensitive areas that the often suggested “solution” of fencing isn’t needed. I have never seen a fence on public lands where cattle were supposed to be excluded–like around a water source, or spot with threatened or endangered species–that wasn’t breached, sagging, down or cut somewhere, somehow mysteriously allowing cattle access to the area. The only meaningful solution based on my experience is to require the permittee to keep the cattle far away (and it is still likely that cattle will “mysteriously” trespass into the protected area). In my neck of the woods there is a lot of old barb-wire fencing left from when there used to be cattle grazing. Many places it was only removed for hiking trails. I’m not sure why it was not all removed, maybe too expensive? It’s like having trash everywhere. If it’s public lands, agencies will claim they don’t have the staff to take out old fencing. But there are numerous volunteer groups willing to take out barbed wire on public lands. Wilderness Volunteers (www.wildernessvolunteers.org) is one. Let the agency know you’re concerned about harmful impacts of the old fencing, and give them info about available resources. I’m still haunted by the impaled great horned owl I saw on old fencing in NV. Its wing had gotten stuck in the wire and it must have died a horrible death, lingering there for days. These old fences are a big problem for wildlife, so I encourage you to take action. I see this getting worse and worse in the future. 🙁 Good post. Livestock grazing on public lands cannot be justified economically or ecologically. So why does it continue? The graves of millions of Indians, the huge mountainous piles of buffalo bones, the amount of forest converted to brush because of over harvest, deadly dynoflagellate outbreaks caused by hog farm pollution, the number of people killed by leaking oil & gas pipelines–the list goes on and on and on……….. Historical facts are dangerous to corporate greed. Because they fear that we might learn the truth and then do something with it, they become more and more greedy and controlling. Even the deaths of thousands of humans are meaningless to them. So how could the demise of grizzly bears or that of the passenger pigeons have any meaning? Dominance over resources and the minds of people at large is essential for them to continue their corporate exploitation despite the impacts to our existence. Somebody mentioned 200 million cows- its time to cull the herd before their benefactors cull us. And so what massively relevant and wonderfully substantive and succinct comment is the above supposed to convey? The US is suffering from insufficiently restrained trolling commentary, especially in the last couple years. Is it too much to ask that issues profoundly important and lived by us should not be infested by such as the above? As a refugee from the infestation across the entire internet of fools< i only returned to TWN today, finding trolling by unschooled, individuals obviously intending to arouse hostility. Whatever you do with my comments, I care not, so long as you remove the obvious intentional trolls. In further reply, while trying to post on Do You Have Some Interesting Wildlife News,I continued to get 404 Website not found. So I put test on this string, and it worked. When back to the former thread. 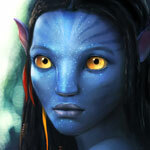 Same problem…got in touch with Ralph, and figured it out. Word Press does not have edit or delete options. Hope that explains it enough for you. As a former resident of the area, I know that Harris Ranch also trucks their cattle down to lower elevation BLM lands in Owens Valley, so they gain fro the incredibly low pro=iced exploitation of taxpayers for the entire lives of their cattle until transported to the feedlots. Meanwhile both valleys are affected. LA DWP may also have been leasing Owens valley to this ranch corporation. You must realize that these were ancient flyways, with wetlands, a significant portion of the subarctic to Colorado delta, great basin flyway, of which Las Vegas (the meadows in Spanish) along with numerous other water-table-dependent migratory routing has been destroyed for a greater amount of time than that of which you are aware. hawks, white pelicans, swans, and other birds I noted, depended upon the linked system. Remember too that Owens Lake was huge enough to require long-distance ferries to the mines, just as Mono Lake was once used for ferrying the Jeffrey Pines to the mining towns like Bodie, which, I believe burned down more than once before its final demise in the 1930s. The entire taking of Northern California (what you call northern is actually central California)water has destroyed the capacity of natural ecosystems that contained immense numbers of several species of salmonids, which up until the takings began, actually made spawning runs as far south as the San Buenaventura (Ventura) River watershed in SoCal). Ca’s largest lake by area was the one fed by the Kings and Kern watersheds. Because of cotton – a useless material for cool or wet habitats) that portion of the Centrla valley cannot support its original Tule Elk , it’s wildlife, its migratory birds who survived intot he 20th century. Mowing down the redwoods and mixed oak/conifers of Mendocino, Sonoma, Napa counties for spoiled grape juice prevents habitat recovery there.This poison fruit has even penetrated into former forests of northern CA and Oregon. THe dams that republicans try to prevent removal on the Klamath, have taken out thousands of square miles of salmon habitat, as has the shunting of Eel River down to the profitable garbage in a bottle. Back to the eastern Sierra: Pah is a rendition of the Shoshone/Ute word for water, so, when you pass any of the dessicated communities with that in their name, you know that they occupy seasonal wetland or spring space, through Nevada and CA. We are in dire need of depopulation, as just a few decades have so changed every one of these and other areas of the west, that they destroyed. THe Forest Service allowed massive cutting of THe long valley area’s Jeffrey Pine forwsts, just within the past 3 decades, along with allowing the ecologically new destruction of ORVs to prevent those eastside forests ever from recovery. THe mule deer herds – each funneling out of one or two Sierra valleys into Long, Round, Owens Bridgeport, and other habitat – of the Sierras once traveled very distinct paths down the creeks to winter in Long Valley, and of course, once with a nose can travel along 395 there to find many killed by traffic each year. I’m not going to bother editing this for clarity or length, as the whole issue is too profoundly disgustingly rage-inducing to one who has seen a lifetime of deterioration there. The “Antelope Valley, which is part fo the Long Valley complex (generally about 6000 to 7600 feet in elevation, was just one of the MANY California and Nevada valleys filled with thousands of pronghorn, a browser adapted to the semi- and arid landscapes until the toy popgun-carrying Euroimmigrants came. Mammoth Lakes had until 1964, some nearby geysers. Those geysers were drilled for exploration as to the geothermal capacity then, and of course the geysers died. Hot Creek still contains many springs, as does the valley uplands. These places, once difficult to reach unless walked or X-c skied in winter, became prey of the grubbies and the constructionists, who created cement tubs in several places, excluding numerous species they never even saw. Fences. Because of the excessive explosion of offroad vehicles, BLM and other management have increased dividing fencing in the past few decades. Of course, popgunners kill coyotes and other creatures for pleasure. Ive seen the bodies, of many of the species I;ve mentioned just left by these killtoys. It’s all real estate greed folks. Are you part of it? Needs to be said, very sad, and extremely worrying because the water issue is going to become urgent in the years to come, between drought, damming and draining rivers, overpopulations – denying water to wildlife is happening right now. And the intensity of the fires.